1- Christmas champions: Forget about a Liverpool slip up. Although in the last ten years the Anfield club is the only side not to win the Premier League after leading at Christmas, the experience of tripping up in 2008/9 and 2013/14 will come in handy. This time there will be no Steven Gerrard slip or poor game management akin to the one witnessed at Selhurst Park where they let a 3-1 advantage melt into a draw. 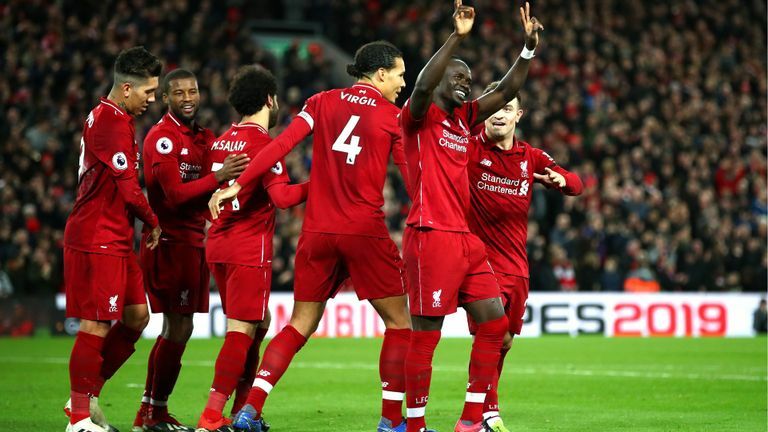 2- Strong record against Top Six: Even before this season, Liverpool manager Jurgen Klopp was comfortably leading the mini league against Top Six rivals. This should come in handy during the second round as Liverpool has mastered the art of annihilating lesser opposition. In the first round, the 18-time champions won every game they played against teams outside the Top Six. Expect more of the same. 3- Fabulous front three: Felt for the Kop when they ended up empty handed last season despite their fabulous front three of Mohammed Salah, Roberto Firmino and Sadio Mane bludgeoning over a century of goals. Though they are not quite firing at the same rate, as a triumvirate, they still consistently guarantee more goals than what strikers at title rivals Manchester City and Tottenham Hotspur are offering. I therefore feel the trio are to be compensated for missing out last time. 4- Best defense: Eight goals conceded after 20 games of the campaign implies Liverpool can match or beat the all time defensive record of 15 conceded set by Chelsea in 2004/5. In defensive stakes, Virgil van Dirk favourable competes with EPL legends John Terry, Rio Ferdinand, Nemanja Vidic and is a notch better than Jamie Carragher, Sami Hyppia or any other Kop defender since Alan Hansen and Martin Lawrenson. 5- Successful signings: Unless Tottenham Hotspur beefs up their squad during the January window, their inability to recruit any players last summer will catch up with them at the tail end of this season. On the other hand, Liverpool’s summer recruits – Alisson Becker, Fabinho, Naby Keita and Xherdhan Shaqiri have come to terms with the league’s demands, ensuring Klopp can have a fresh squad in the home straight. 6- High number of players on form: Kop boss Jurgen Klopp is blessed to have such a big number of players operating within their element. Becker, Virgil van Dirk, Andy Robertson, Georgina Wijnaldum, James Milner, Xherdhan Shaqiri and Sadio Mane are all playing to their full potential. This is not the case at Manchester City where a number of their big name players have gone Away Without Leave (AWOL), leaving the burden of expectation on the young shoulders of Raheem Sterling, Bernardo Silva and Leroy Sane. 7- Gengenpress: Liverpool’s suffocating, offensive style of play first seen at Borussia Dortmund under Jurgen Klopp is the most demanding approach to the game to both Liverpool and opponents. Kop players thrive best on this heavy metal approach because Klopp has had four years to ingrain it into their blood but it leaves Premier League opponents in a spot of bother. Liverpool squeezes the last bit of sweat out of opponents who simply can’t cope.